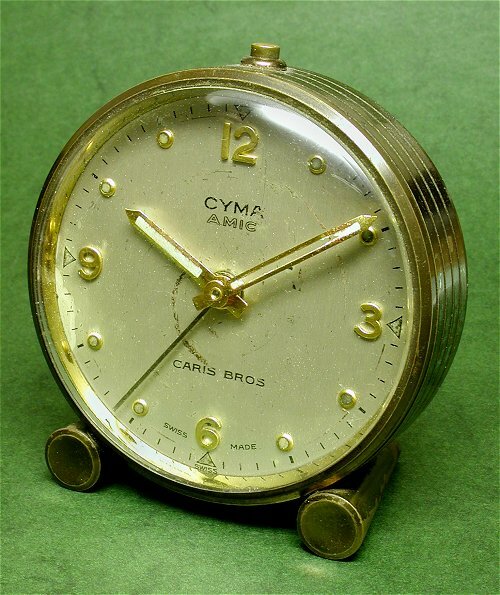 Here are a couple of Cyma alarm clocks I have, housing the cal. 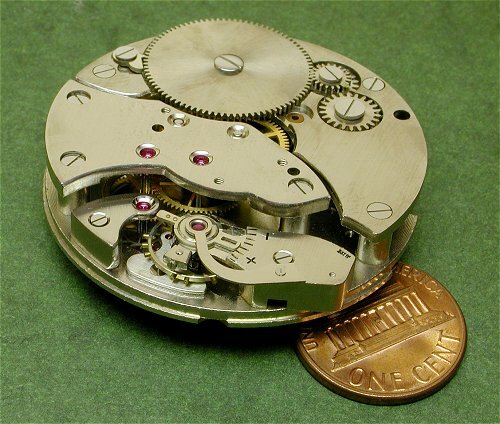 R10 movement which is a 10 jewel movement of 22 lignes (49.6mm or 23 size) diameter. Of course, coming from a watch manufacturer, they beat at a respectable watch-type rate of 18,000 bph. I still use this as my bedside clock. Another point of interest to me is that the dial is marked with the name of a local jewelry store (Caris Bros.), which closed down in the 70’s, after having been in business since the turn of the century. 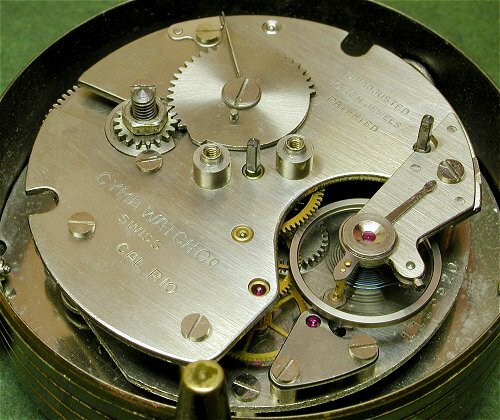 The movement is well finished for a clock movement – almost as nice as some watch movements – with straight grained plates, snailed winding gears, and the plate edges cleanly finished. I believe these clocks date back to the 50’s, and the movements are listed in parts catalogs from the 40’s. 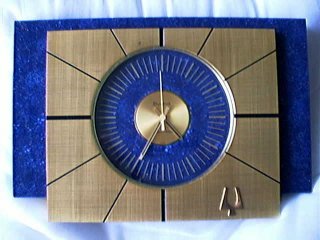 I obtained this second clock (below) from a watchmaker’s estate sale about 15 years ago. It still has the shop repair tag on it, quoting a price of 1/6 (one shilling and sixpence) for the replacement of its broken mainspring. Australia changed from Pounds/Shillings/Pence to Dollars and Cents in 1966 – and the decimal equivalent of 1/6 was 15 cents. Not an expensive repair, but apparently was too much for the owner, who never returned to collect the clock. To this day, more than 35 years later, it still awaits that new mainspring… one day I will get around to it! This is a Bulova Accutron clock. 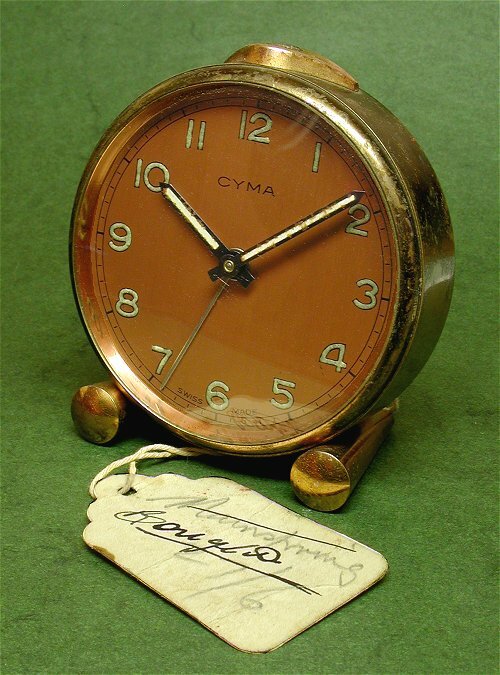 Bulova used a standard Accutron 214 movement fitted into a specially built case, rather than design a special clock movement as most other watch manufacturers did. May 24th 2001, Perth, Western Australia.